The author has a simple subtitle to this book, “A Thriller.” I love the Mitch Rapp series and this book lives up to the subtitle as a thriller. Act Of Treason is different as Rapp is almost part of the sub-plot. The real story is about Washington power and those who would do most anything to achieve that power. Author Vince Flynn uses the usual cast of characters in this exciting novel. Act of Treason doesn’t have as much of the covert operations-type danger as past Rapp novels which is a nice change. I could kind of figure out what was going to happen in many places and I liked that. As usual Flynn provides insight into the world of politics. One of the central themes is the peaceful transfer of power when a new president takes office. This novel shares more of a viewpoint of the role of the Secret Service agents. They must have an interesting job and have a high capacity to keep their mouths shut. Has an agent ever written a tell-all book? It should be noted that the New York Times has a writer named Frank Rich who has no love for conservative issues. I was careful not to call Rich a reporter or even a journalist. Or is it based on “journalist” Joe Klein also from the Times? He may be more transparent in his bias than Rich. Is the Tim Rich character based on either Joe Klein or Frank Rich? There is no doubt about the slam of the New York Times. This article was published on May 17, 2010 . 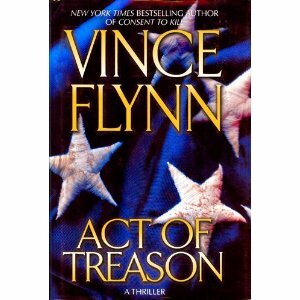 It is tagged act of treason, Book Reviews, cia, frank rich, joe klein, mitch rapp, new york times, politics, secret service, thriller, tim rich, vince flynn, washington. You can follow any responses to this article through the comment RSS feed.